Cornell’s reach has no boundaries. 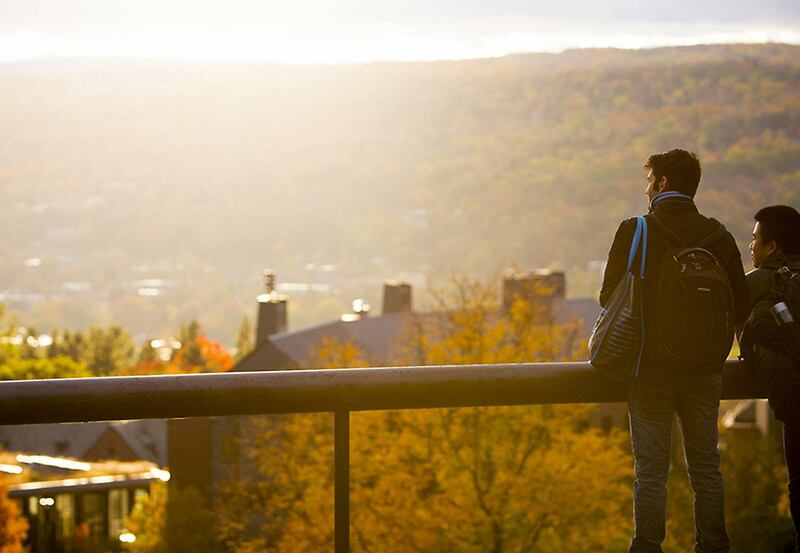 There are places, people, and organizations on our campus that bring the world to Ithaca and send knowledge created here back into the world. Your gift will create an exchange of knowledge between students, faculty, the community, and the globe. A gift to students in the AguaClara program brings clean water to communities in Honduras. Or, a gift to Students for Hunger Relief helps provide food to those in need within the Ithaca community. Like these efforts, there are hundreds of student groups benefiting people, one life at a time. Make their work possible. Our university library stands at the center of intellectual life on campus. The library provides an invaluable place for students and faculty to research, study, and learn about topics well beyond our walls, accessing renowned collections and experts guides. Help drive our mission to discover, preserve, and disseminate knowledge. The admission-free Herbert F. Johnson Museum of Art is a leading campus partner for interdisciplinary learning and direct experiences with art, opening new doors to lifelong inquiry and exploration. This is a fundamentally relevant aspect of a Cornell education and enriches visitors to campus as well. Your gift is keeps this inquiry and exploration possible for anyone that seeks it. Open more doorways to art and culture. Cornell Botanic Gardens conserves and cultivates flowers and plants and enriches Cornell's teaching and research programs. It also hosts environmental education opportunities open to all to inspire an understanding and appreciation for plants and the cultures they sustain. The gardens offer walking paths, natural areas, and some of Cornell's most beautiful landscapes. Your gift keeps green spaces vibrant—both here and wherever those who are touched by the gardens reach out. Grow our gardens. The Lab of Ornithology restores forests in Latin America and coordinates over 400,000 birders across the world to investigate the effects of climate change and advocate for the protection of declining species. And that's just the start. Your gift to the Lab of Ornithology helps find new ways to conserve birds and other wildlife on our planet, as well as the habitats they need to thrive. Play a role in protecting our planet. One of the best ways to put life skills into action is through sports and athletic activities. Cornell Athletics provides the perfect environment for students to learn leadership, trust, teamwork, and commitment. Your gift to these student teams helps teach skills that cannot be acquired in a classroom. Build lifelong skills. When you support resources on our Ithaca campus, you invest in key activities that help students and faculty succeed.